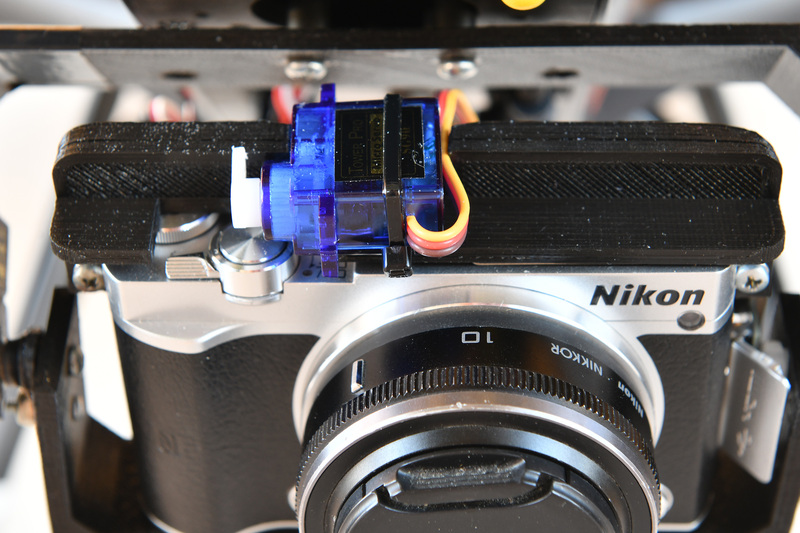 For anyone interested I have finally made up a mount and mounted a small servo on top of my Nikon J5 to activate the shutter using the pause button on the controller. This bird has open solo and I finally soldered another servo wire in and set up ch7, long press to activate shutter and short pause to reset. May not look pretty and I am only new to 3D printing but it works. i was using the invertolometer in the camera to take a photo every 15 seconds, but now having shutter control is much better. Thanks to Pedals2Paddles for his work on open solo 3, without this I would not be able to achieve shutter control (not available on standard solo software. Total weight of this setup is 1.9kg, flies for 15 minutes returning home with 20% on battery. ...where there's a will, there's a way. Nice work. Awesome job! Innovation at it's finest. It looks like you have a seperate servo for pitch? How do you control that servo to tilt down like in the 3rd picture? Did you connect your mount to the fixed 3DR mount plate? Did you change the gimbal mount balls or used standard 3DR balls? The servo is controlled by the tilt button on the back of the controller, the same button as used to tilt the 3DR gimbal. I pulled the center leg that holds a gopro out of the fixed plate and made a couple of short legs to attachmy mount to. what is the safe shutter speeed for you? 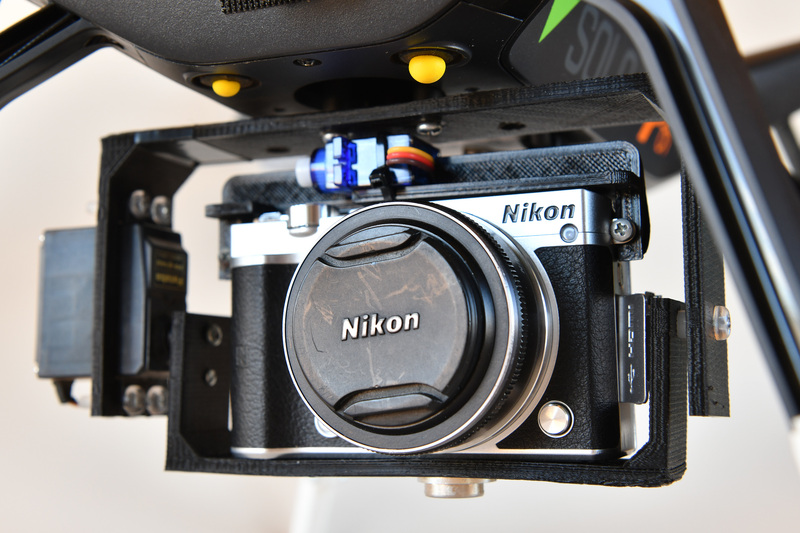 This mount with the servo directly mounted to the lower bracket where the camera sits allows a full 90 degree option, still using ch6 and the gimbal tilt control. I see you have added different servo - have you moded it to get 90 degree tilt? I shoot shutter priority on the J5 1/800 sec. The servo has been modified, i added a 3.3k resistor to each side of the pot in the servo, this gives me the 90 degree tilt. I have been using an old Futaba S148 servo on my tilt. I printed up another mount (always trying to refine things and I need a spare) and I had to buy a servo, can’t get the S148 anymore so was suggested a Futaba FS3001 ( the new version) and it works but is a bit jittery and i can’t get it like the ols one. Being in a rural area there are no hobby shops, everything is on line order. I am thinking of trying a digital servo for tilt. I know you are talking about shutter but I wonder if its getting a glitch or a jitter and its affecting the flight. No, not servo is cousing it - pressing pause button for 2 sec does it. 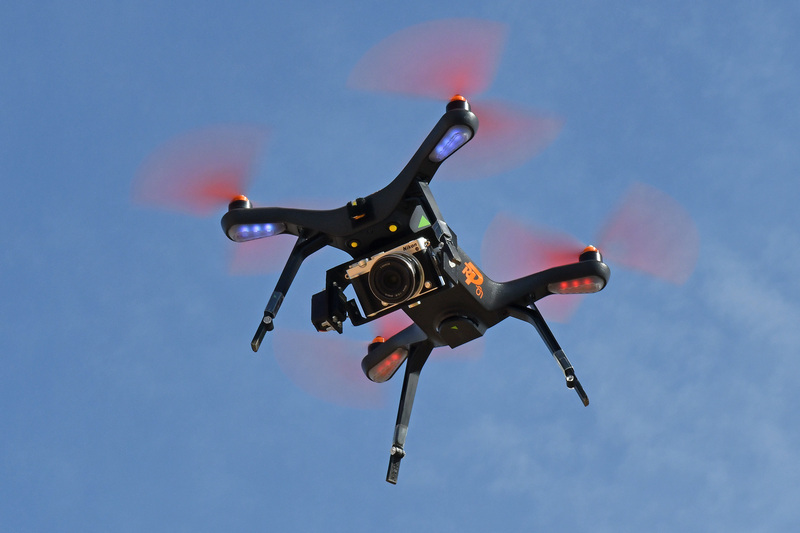 The drone is hovering semi still, and when press and hold pause, then drone starts to operate strange. Just wondering though, when you press the pause it operates your shutter servo and maybe causing interferance, just a thought. Yes, that can actually be a problem. Are you taking 5V from gimball conector or soldered on the main board (mine is from gimball conector for tilt and trigger as well, maybe that's an isue - 4.75V to 5.4V 1A). I ordered such ones - RDS3115 & JX PDI-2504MG (this one shows Working frequence: 1520μs / 330hz, knowing that CH6 tilt is limited 1000-1520μs, maybe will not need resistor mod). My 5 volt is from the gimbal connector too, both the tilt and the shutter. I had no trouble with my old servo, only a new one. Nice carbon fibre by the look of it. I have put the new tilt servo (HS5475hb) into the mount and bench tested, no jitters at all. Hasn't got the full throw I want (that's next weeks job when i am back at work and can access programmer) Am going ot do a test flight as soon as the weather settles.